A fire occurred in Downtown Berkeley early Saturday morning. 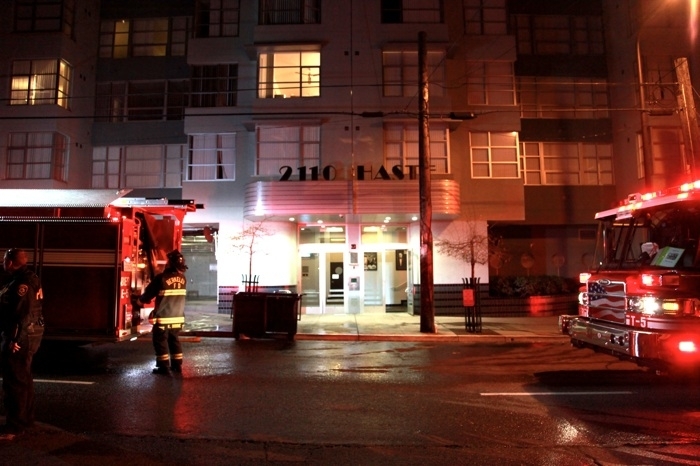 Berkeley Fire Department firefighters responded to a dumpster fire on the ground floor of an apartment building in Downtown Berkeley early Saturday morning. No one was injured. At about 12:05 a.m., the department received a call reporting the smell of smoke at 2110 Haste St. and arrived at the scene with five engines, one truck and one ambulance within three minutes. They contained the fire in the dumpster in the building's garage after about 10 minutes, according to Assistant Fire Chief Donna McCracken. Everyone in the building, with the exception of at least two disabled residents who sheltered themselves in their units, had evacuated the building by the time firefighters arrived, she said. Though the cause of the fire is still under investigation, McCracken said the dumpster was "totally accessible" and that both the garage doors and gates enclosing the trash area were open. Building resident Ryaan Burke-Rose, who lives on the second floor, said she was sleeping when the fire started, adding that she evacuated the building when she smelled smoke. The building consists of four floors of apartments, with several businesses on the ground floor. Residents were allowed back into their units at about 1:12 a.m.